The Protestant Reformation marks a half millennium in 2017. On October 31, 1517 Martin Luther nailed his 95 theses to the door of the castle church in Wittenberg, Germany. This single act was responsible for a worldwide movement whose legacy is still felt today. It was an event that changed the world—the Reformation did not only affect theology and the church but also had an impact on culture, science, business, politics, language and education. This great anniversary is being celebrated with exhibitions, festivals and concerts across the country. Take the 500th anniversary of the Reformation as an occasion to travel with your group to Germany and follow in the footsteps of Martin Luther on a fascinating journey to the age of the Reformation. More than 30 sites all over Germany allow you to discover Luther’s legacy. There are four prominent Luther cities in Germany: Eisleben, Wittenberg, Eisenach and Erfurt. Luther was born in Eisleben in 1483 and died there in 1546. But he spent the greater part of his life in Wittenberg, where he taught and practiced his beliefs for 35 years. 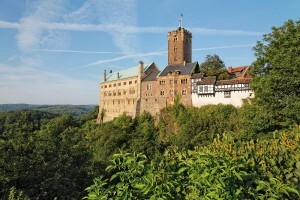 At Wartburg Castle in Eisenach, Luther translated the New Testament into the German language, in 10 weeks time. Erfurt was of importance for Luther’s life, since he studied there and also became a monk. Located in the heart of Europe, Germany is easy to reach. Every week, there are almost 500 nonstop flights from the U.S. to Germany. The excellent infrastructure, from high-speed trains to rental cars, buses and domestic flights, makes traveling the country simple and efficient. When it comes to hospitality, Germany offers services for everyone. Germany has boasted one of the lowest average hotel rates in Europe for many years. Now, the record-low euro-to-dollar exchange rate makes Germany an irresistible value for your group. 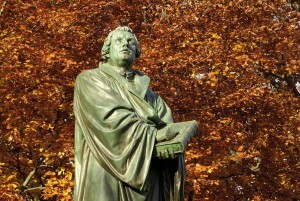 For more information on Luther events and exhibitions, visit www.germany.travel/luther.